Director Ron Daniels has joined the creative team in preparation for a workshop at The Other Palace in spring 2019. Ron, formerly artistic director of The Other Place and associate artistic director of the Royal Shakespeare Company, also directed the opera Il Postino, based on the same source material as The Postman and the Poet. Michael, Eden and Trevor are proud to be working with him. Six Nights in Naples, Charing Cross Theatre. This filmed performance of Six Nights in Naples showed selections from the show linked by narration. The full script and a demo recording are now available. 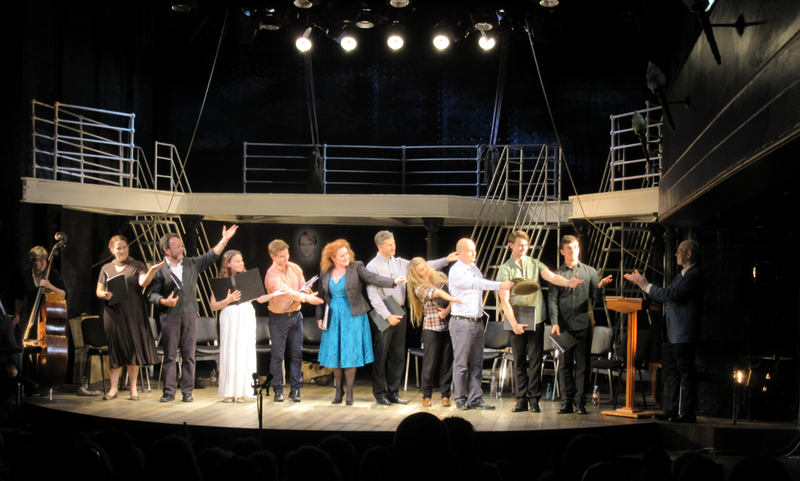 Six Nights in Naples was performed by final year BA Musical Theatre student from the London College of Music at Lawrence Hall, University of West London. The book and lyrics for Six Days in Naples are by Eden Phillips and the music is by Richard Link, the show’s musical director. The author calls it a ‘fantastical tale’ that, without giving too much of the plot away, has a supernatural dimension as well a theme beloved of countless films and shows of yesteryear: high art versus popular culture, opera or Broadway show. It says a lot about the expertise of Phillips’ book that this old cliché doesn’t pall but rather enhances the juxtaposition between the drama and the lighthearted scenes. Phillips, who counts musical versions of Alfie and Love in a Cold Climate amongst his credits, knows just the right moment to surprise us with a plot development to sustain his yarn spinning along in high gear. The fluency of his writing is buoyed up by the effervescent and tuneful score by Richard Link. Six Nights in Naples is given a generous welcome that is fully deserved. Six Nights in Naples is a musical based on an original idea by Eden Phillips (book and lyrics) with music and orchestrations by Richard Link. Set in the San Carlo opera house Naples in 1943, it explores the tensions between British soldiers and Italian singers and musicians, and affectionately spoofs the conventions of opera and musical comedy. The plot is deliberately fantastical, with characters falling in and out of love with one another at a moment's notice, while the 'spirit' of the San Carlo hovers in attendance. The show is directed by Marc Urquhart, who also choreographs in tandem with Emma Evans. 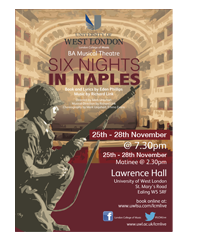 Six Nights in Naples will be performed by students of the London College of Music from the 25th – 28th November 2015. To book tickets, please select your preferred date from www.uwlsu.com/lcmlive and follow the instructions. Alfie the Musical is a great success! "There's a huge amount of talent in this London College of Music company"
"Eden Phillips' book and witty lyrics ... and John Cameron's catchy music provide … a cracking evening full of tuneful ballads and lively ensemble numbers that would not look out of place in the West End." Read the full Musical Theatre Review here. 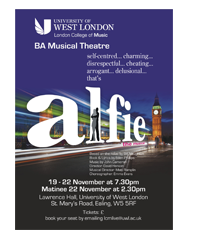 Alfie the Musical will be performed by students of the London College of Music from the 19th – 22nd November 2014. To book tickets, please select your preferred date from www.uwlsu.com/lcmlive and follow the instructions. The discovery of THE POSTMAN AND THE POET (CD) is the discovery of a treasure. … Acoustically, this musical is a true listening pleasure from the first to the last second. In addition to reflections of Boublil/Schonberg's musicals Les Miserables and Miss Saigon in the overture and ensemble numbers, composer Michael Jeffrey has developed a style all of his own – Latin rhythms, fitting to Chile, can be heard in the very peppy "Taca Taca" (and "Dance at Rosa's") and also in "Poetry is Poison". There are many musical highlights on this double CD. In the leading role of the poet Pablo Neruda is Ethan Freeman. For over 20 years he has been the crème de la crème in German musicals, and has appeared on Broadway and in London's West End. He exhibits his power to express emotion in his only solo "Speak from the Heart". The same quality applies to "Stolen Words" sung by Simon Thomas (Mario) and Joanna Ampil's (Beatriz) singing "You're a Man". The presentation of the CD should also be mentioned. Although a concept album, one still gets a double CD and a 60-page booklet with the libretto, background information and several photos. It only remains to be hoped that this powerful musical will one day find its way onto the stage and the CD recording will have been just the appetizer. This could be such a beautiful musical. More please! Great price deals for new and used CD's. Designed and built by Dot2Dot Design Ltd Copyright © 2014 Eden Theatre Ltd. All Rights Reserved.